First teased during the MWC 2018 conference, Xiaomi is scheduled to take the wraps off its next flagship smartphone, the Mi Mix 2S, on March 27. The company has already confirmed that it’ll be their first phone powered by the Snapdragon 845 processor. However, Xiaomi is now dropping new teasers on Weibo to hint at features coming in tow with the Mi Mix 2S. In line with the same, the Chinese giant has today released another teaser, the latest one talks about the camera capabilities of the device. The Mi Mix 2S follows the ongoing trend and will bring along AI capabilities to the camera to enable users to capture even better photos. 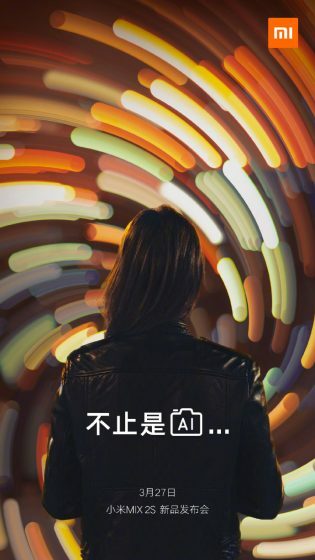 The teaser image shown below was accompanied by a question, where Xiaomi asked its users to identify whether the photo (shown in the teaser) is captured solely via the camera or has AI been employed to get the required background effect. So, if you ask me, there’s no doubt that the Mi Mix 2S will feature AI camera capabilities to provide users with many different options to capture stunning photos. This photo does use AI for edge detection and background blur (bokeh), but the dynamic range and color reproduction are commendable due to Sony’s IMX363 sensor that has been speculated to be featured on this device. This is just one rumor, others go to the lengths to say that Mi Mix 2S may feature a dual rear-camera setup. In addition, we already know that Xiaomi is extensively working to integrate AI into all of its phone’s features. The Mi Mix 2S is said to be bringing AI scene recognition, which will enable you to just point the device at the subject and the photo will be tweaked based on the surrounding, lighting condition and other contributing factors. Prior to this, Xiaomi had released a teaser image with the AnTuTu benchmark score of the Mi Mix 2S. It scored a whopping 273, 741 in the benchmarks to shine a light on the power of the Snapdragon 845 mobile platform. The Mi Mix 2S is also expected to further increase the screen-to-body ratio, challenging its market competitors to match their standards. It’ll still feature the ceramic back from previous iterations, which is always good. So, are you excited for the Mi Mix 2S launch? Tell us in the comments below.